For as long as she could remember, Katelyn Ohashi had been a gymnast. As a young athlete who showed immense promise in sport, Ohashi came to understand that her worth as a human being was dependent on her athletic performance. With every gold medal won, pass landed and weight made, Katelyn received more praise and reassurance. Feeling immense pressure to stay on top, Katelyn focused her entire life on maintaining a body that would support her Olympic dreams. Unfortunately, prioritizing short-term wins over long-term health and mental stability is a common mentality in the sporting community. The attitude that is stressed on athletes is one of, “win at all costs.” After years of emotional and physical stress, Katelyn’s body finally collapsed during a routine on bars leaving her unable to continue competing at an elite level. Injured and unable to continue competing at the elite level, Katelyn experienced some weight gain as her training sessions ceased and her strict diet was not enforced. Not only had she lost gymnastics – an activity that had been intricately tied to her identity and self-worth – she also had to deal with body shamers publicly tormenting her changing body. It wasn’t until Katelyn decided to return to gymnastics at a collegiate level that she was able to re-experience the joy that the sport had once brought her. 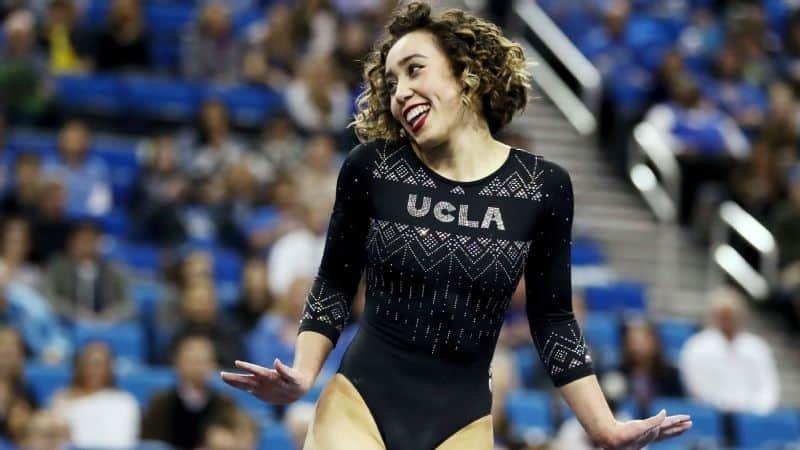 In her most recent meet as a senior at UCLA, Katelyn’s sincere joy was contagious. Not only did she exude a bright light as she shined on the mat – she scored 10’s across the board, has amassed over 35M views on social media of her breakthrough performance and has become a national celebrity of what ‘doing it for the love of it’ really looks like. In addition to finding joy in gymnastics again, Katelyn has also worked to enrich her life in other areas besides sport. Her experience being body shamed and pressured to look a certain way sparked her interest in poetry. But here today, I stand, with the love that penetrates deeper than any wedding band. Because I am my own size, and no words or judgmental stares will make me compromise. For the bittersweet satisfaction that lays between my eyes and my thighs. I finally got my cake and ate it too; for my old self cries. Katelyn’s journey demonstrates to us all the power and importance of paving your own path to happiness. It’s all about what brings you joy, being candid about struggles we all experience and living life as your truest and most authentic self. 1. Body-Shaming: What Is It & Why Do We Do It?